Tickets Together is a Facebook app that lets you buy cinema tickets and arrange an event simultaneously. It's currently being used to sell tickets for Toy Story 3 in the US, but I'm assuming it'll be extended to other titles soon. In the US it uses 3rd party ticketing agencies like Fandango to do the transaction; over here there is no similar arrangement, but you'd hope that they'd be able to organise something. 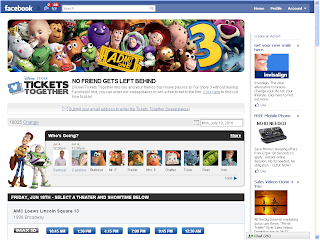 Booking cinema tickets through a site like Facebook is such a no brainer, and part of a growing trend of being able to spend money on the site.